*Use regular instead of “light” ground turkey for best results in this recipe. 1. In a large mixing bowl, combine falafel mix, turkey, mint leaves, black pepper to taste and 3-4 tablespoons cold water, to moisten. Shape mixture into 12 small patties. 2. Heat a grill pan or large skillet over medium-high heat. Spray with non-stick cooking spray. Grill patties for 3-5 minutes per side, until no longer pink in center. 3. Meanwhile, heat a large skillet over medium high heat. Add olive oil and Bermuda onion. Sauté for 10-12 minutes, until softened and golden. 4. In a small bowl, stir together tehina with ¼ cup water. Add more water to make a thinner sauce, if desired, set aside. Heat rolls in a 250°F oven for 5 minutes, or until warm. 5. 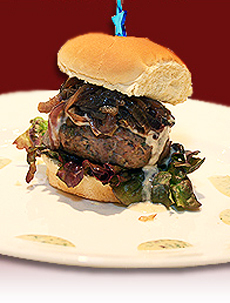 To assemble sliders: On a plate, place bottom half of roll, lettuce leaf, cooked patty, onions, 1 tablespoon tehina and top half of roll. Garnish with additional chopped mint leaves. Serve remaining tehina sauce on the side for dipping. Find more of our favorite international recipes.